We enjoyed having our daughter home from Australia over Christmas and into the New Year, but are now pleased to welcome guests once more. Not that everything ground to a halt during that time. Jan has been busy making marmalade and jam (using our own blackcurrants, frozen last summer when we were so busy) and catching up on jobs in the bedrooms to make sure that everything is up to the standard that our visitors expect. On the farm two new hedgerows have been planted, and a third will be completed this week. 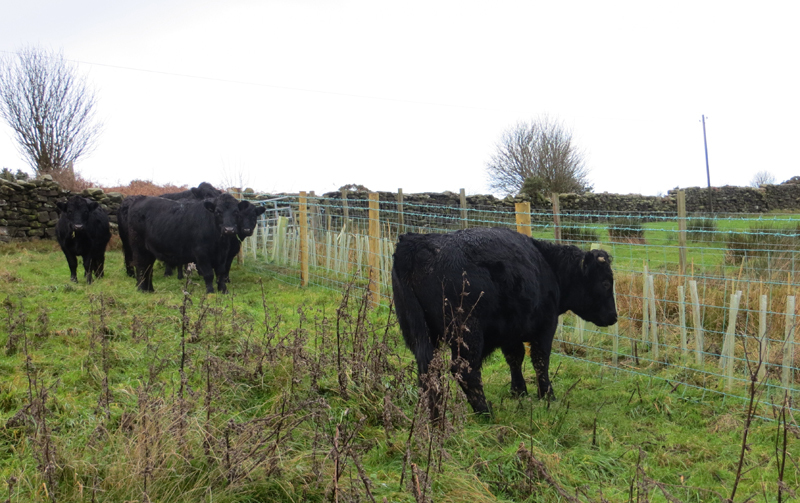 The work, undertaken by the National Park’s apprentices and volunteers, has been closely scrutinised by our cows, as the photo testifies! Easter is early this year, so to avoid disappointment don’t leave it too late to book your break. We are also pleased to welcome the Tour de Yorkshire back to the area during the early May Bank Holiday, and already have one booking for that weekend. Why not come along and enjoy the spectacle of professional cyclists tackling the steep climb up Sledgates? Bring your bike too – we have secure storage facilities – or just enjoy our countryside and coast on foot or by car. There’s something for everyone.